Racer is a racing game, a top down one, very minimalist, in a retro way, following the ideas and recipe that were first observed in action in the era of the Atari 2600 game Grand Prix. Thus, all the world is as flat as it gets, but the graphical elements around are cool, look like they belong in a 16 bit game, from the SNES era. It's definitely got a retro vibe in it, like a revisiting of very old games, and then trying to recreate them in a visual style that is a tiny bit more modern. And, for all intents and purposes it works. 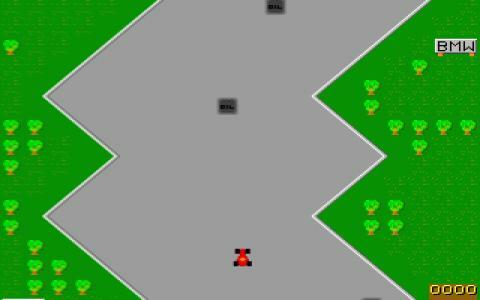 Your racer is very small and limber, and the tracks scroll down towards the lower portion of the screen. You have to follow the road, avoid the traps and the bricks as well as the other vehicles on the tracks and hopefully be the winner. There are some ideas of vehicle weight and physics governing the way you move, but don't expect a game that offers you the amount of detail that some other racing games could offer you. Nope, it's more of a bare minimum combination of elements, and, for the most part, it works pretty great. A good alternative can be Superspeed Deluxe if, similarly, you want a retro racer, but this time, one that is all about one screen tracks than top down forward scrolling remakes.